Will Many Of Our Kids Go To Space? Space travel for our kids' generation is very likely! Folks of my generation might have dreamed and aspired to travel in space but it is certain that a large number of today's kids will go to space. SpaceX and Virgin Galatic are making great strides in attempting to wrest the frontier of space from government and commercialize it. Meanwhile, in the background and somewhat quietly a 'youthful' revolution in rocketry is brewing! All over the world rocketry competitions are becoming quite the school kid pursuit. The contests are becoming popular across the world! The International Rocketry Challenge is the culmination of three separate competitions held annually around the globe: the Team America Rocketry Challenge (TARC); the United Kingdom Aerospace Youth Rocketry Challenge (UKAYRoC) sponsored by ADS, the UK Aerospace, Defense, Security and Space association; and the French Rocketry Challenge sponsored by Groupement des Industries Francaises Aeronautiques et Spatiales (GIFAS), the French aerospace industries association. Each contest brings together teams of middle and high school students to design, build and launch model rockets with the goal of inspiring young minds to become engaged in science, technology, engineering and math. This photograph shows the winning team sponsored by Raytheon. What is more, team members are already paying forward what they've learned about engineering and construction according to their mentor Tracy Burns. They plan to mentor younger students building rockets at a youth camp in July and speak at the Huntsville Area Rocket Association in Alabama about their experiences and how other schools can get involved. Last month young Jack Davies (17) of Wellington New Zealand designed, built and launched a 53 Kg. (117 lb.) amateur rocket successfully to 13200 ft. Over 60 rockets including Jack's were launched on New Zealand Rocket Day! Jack's was the largest one and won him the Amateur title for New Zealand! Back in 2013 on November 19, NASA put a satellite built by teens into space. Rohan Punnoose and Adam Kemp of Thomas Jefferson High School for Science and Technology designed and built a communications satellite at the Orbital Sciences Corporate Facility in Dulles Virginia. The TJCubedSat was launched into orbit from NASA's Wallop Flight Facility in Virginia aboard a Minotaur rocket! The entire project is still online as a reference to anyone else that wants to design and build one. In my own backyard here in Boston I actually witnessed an all-girl rocket club brave the cold to build, load and launch rockets in preparation for TARC. 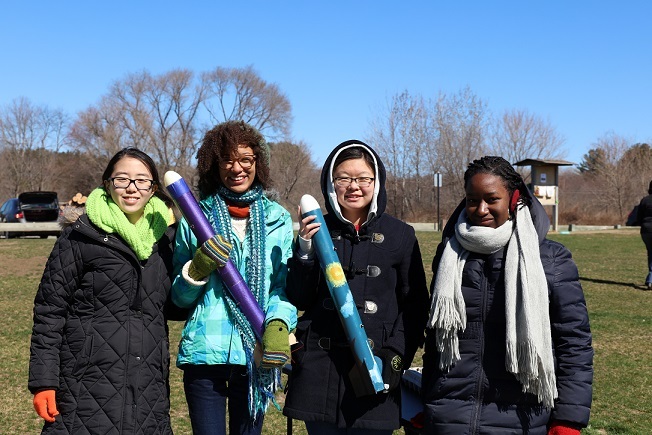 The Science Club For Girls Rocket team launched a 2 ft. rocket with two eggs as payload 980 ft. into the air and brought it gently back down to earth with parachutes! Watching and hearing them talk about wind speed data, altitude, rocket engine and ignition was both inspiring and just a little intimidating! The girls have met actual US Astronauts on two separate occasions! 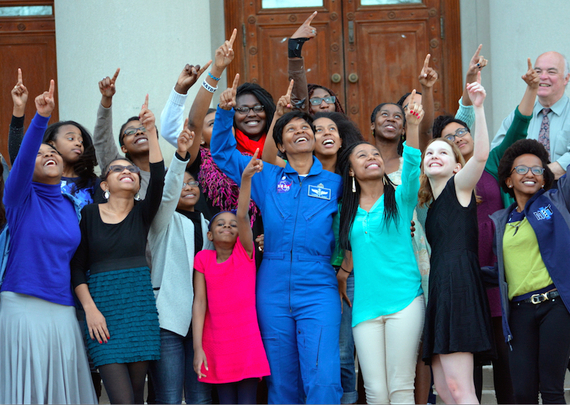 Rocket team met with Dr. Mae Jemison and then again with Dr. Yvonne Cagle (event sponsored by Digitas at MIT) and talked about preparation for going to space! I wish the girls of Science Club luck at this year's TARC and bon voyage to space! Even PBS Kids and Discovery Kids are getting into it and catering to the very young with their dedicated educational pages on rocketry. Curious George tells an interactive rocket story at PBS Kids. Want to teach some basic rocketry? Here is a design and launch simulator! The teens' rockets did not quite touch space but one of their satellites did go into orbit! The passion and knowledge being built up along with the imminent commercialization of space travel makes it seem inevitable that many of these kids will get past the stratosphere! If they are not rocket scientists already, they are going to get there soon enough and more than likely to space as well in their lifetime! Are folks like Elon Musk and Sir Richard Branson following or perhaps fomenting this youthful revolution? It is certainly with both trepidation and pride that folks like us can look forward to our kids in space and support it as best we can!